Well, not so secret really, since I keep a bottle next to my bed, in my bag, and often in the car too. Long time readers will know that I love to use essential oils, and that is the basis for this “magic in a bottle”. This stuff is AMAZING. My favourite way to use it is to roll it onto the back of my neck and shoulders before bed when I’ve been working late. It’s formulated to help with stress and tension, but can also help reduce pain and inflammation AND act as a decongestant. Why’s it so good? What’s it got in it? What of course it doesn’t have in it is the nasties, like parabens, alcohol, petroleum derived ingredients, triclosan, phthalates or GMO ingredients. It is certified by EcoGruppa & NaTrue. Other ingredients? It also has water, fragrances from citrus & flowers (linalool, limonene & geraniol), preservatives, & algin (from seaweed) (which is a thickener). 99.78% of the ingredients are of natural origin & 95.38% of the “vegetal” ingredients are from organic farming. What can the Rescue Gel be used for? All sorts of things!! The idea is that it helps with calming and managing stress and tension, but it is also used by many people to help get rid of headaches, other aches and pains, achy legs, anxiety… It’s fantastic for blocked ears on planes, and I know someone who swears by it for period pain! I know a few families who use this as their primary pain relief, and a fellow Norwex consultant I know says she can stop a migraine with it IF she catches it early enough. 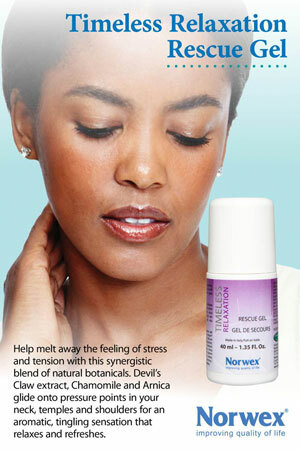 It has a roll-on applicator, which makes it perfect for massaging into sore muscles. Many people use it before bed to help them relax and get a good night’s sleep. I know someone whose child uses it to help calm himself down when he’s angry. My girls love it, and will often roll some on the back of their necks before bed. My 13 year old on the other hand won’t touch it – he says it burns him (which would be the camphor probably, or possibly the cooling menthol). It’s also important to note that Devil’s claw & Rosemary are contraindicated during pregnancy, as are some of the other oils depending on the source (aromatherapy texts are pretty variable in this regard – partly because it depends whether you are going to be using an oil on your skin or just in an oil burner or equivalent). See more about this here. Also, avoid using it too close to eyes – the fumes may sting (many people use it on their temples, but just keep it towards the hairline, not the eyes!). How do you get some of this magic stuff? You can buy it online here, or contact me to order or book a party and try it out (or get some for free in your host spending spree!). Remember too, all the Norwex products have a 60 satisfaction guarantee, so if you don’t like it, you can send it back! And did I mention it’s on sale for April? Have you tried the Rescue Gel, or any of the oils in it? What’s your favourite use? I know consultants who sell several of these at every demo they do simply because they do work on their (the consultant’s) headaches. I find once the headache has taken hold, it provides some relief, but usually doesn’t get rid of it. I have to catch it early. I love it for massaging my shoulders most with the roller-ball (is that a technical term do you think) most of all, and my calves if I have achy legs. Ahh that video is priceless. I too want to be transported back to the land of calm. I need to get some of this stat!